Hi folks! Hope you all had a great summer. We've started to really buckle down on some of these project goals we've set for ourselves this year, with one of the big ones being the ever-awaited Android app. The good news is that we have an Android app that has been created! It's not quite as feature-rich as the iOS app is, but that will come with time. We're looking for a dozen or so volunteers who can give the app a solid test drive before we release it upon to the masses. We'll also be looking for general usage feedback, which we will provide a brief survey for. If you're interested, we just need you to send us an email! If you have an email address you use in Google Play, we will add it to our tester list and send links to purchase the app. Unfortunately there's no way to send free copies on Google Play, but we've set the price as low as possible for the time being. Testers will retain ownership of the app after it has completed testing and is live on the store. We have enough testers now for the time being! Thanks to those who have volunteered! More updates to come! Thanks for listening. 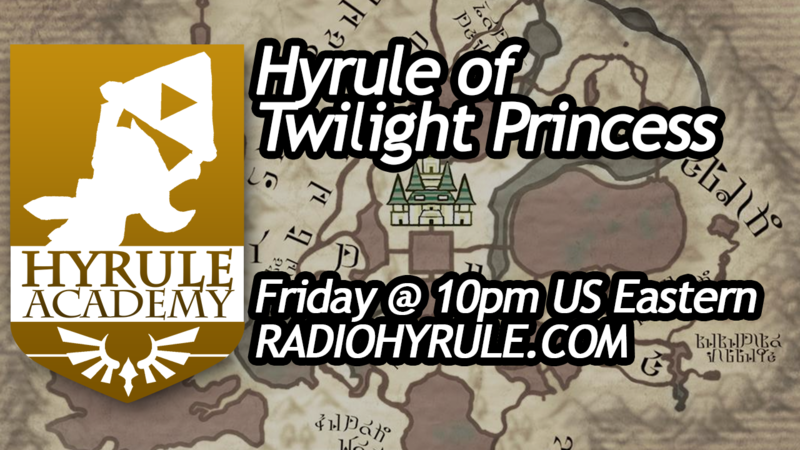 Missed any episodes of Hyrule Academy in the last two months? Good news for you, as we now have archived shows 43 through 50! Hyrule Academy is currently on hiatus until the first week of July, meaning now is the perfect time to get caught up! Visit the Hyrule Academy page to view the full show archive. E3 is on the way with less than two weeks until Nintendo's live coverage! We know they won't be showing Zelda this year, so what else are you looking forward to this year? This week's music is brought to us by new Radio Hyrule artist, SG! Tracks include Din's Dance, The Song of Healing, The Twilit Ballad, and Vaati's Wrath. Enjoy! Is there anything else you can tell us about the progress of the Andriod app? like what stores will you release it to, how much it might cost, and other things? Sorry for the delays! The last few weeks have been crazy with Radio Hyrule Night preparations, but we're ready to buckle down and settle the last (business-related) hurdles remaining for our Android launch. Once everything is ready to go, it'll be available to download from the Google Play store for $1. We'll be sure to let you know! 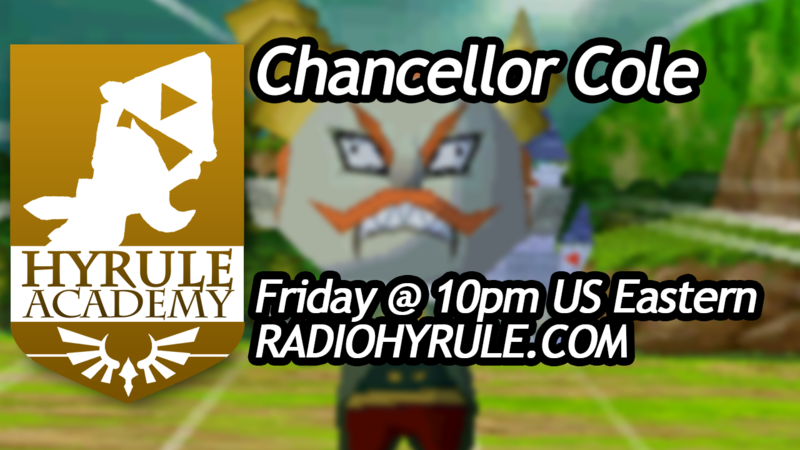 Hyrule Academy is tonight at 10pm US Eastern! 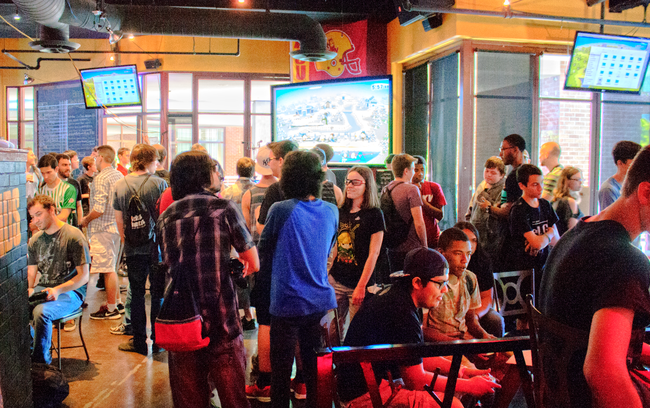 We had a great time last Sunday hosting Radio Hyrule Night at Endgame in Tempe, AZ! 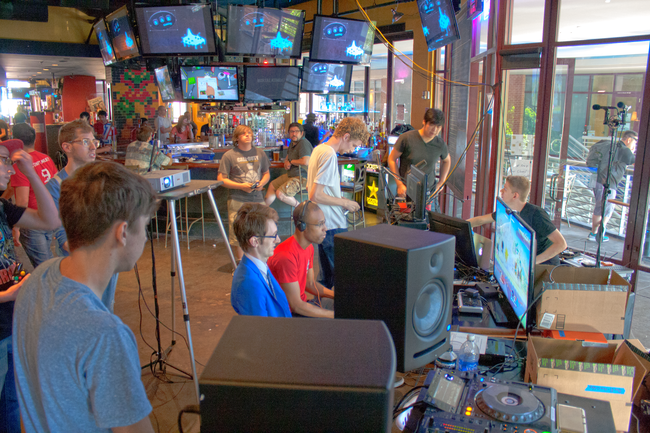 We had some great music, Hyrule Pub Quiz, and an awesome Zelda DJ set by OverClocked ReMix Judge Flexstyle. 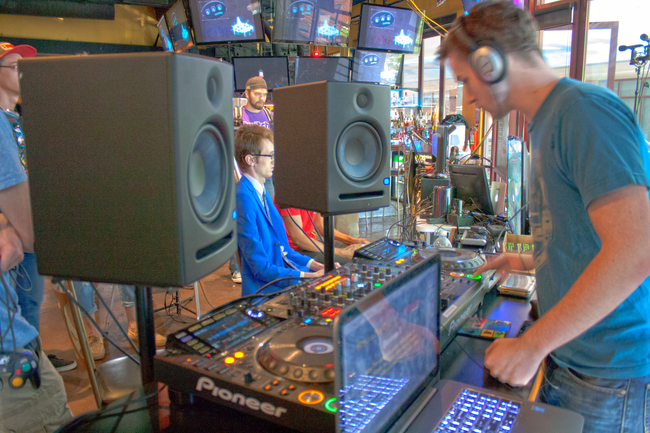 We have a recording of his full DJ set, which we will be airing immediately following Hyrule Academy next week! Be sure to stay tuned in for that. Here are some photos taken from the event! Sorry for the lack of Friday updates! This weekend we're attending Phoenix Comicon. Hope to see some of you there! 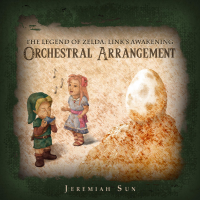 In case you missed it, we held a special event last night featuring Jeremiah Sun's arrangement album dedicated to Link's Awakening. He has kindly granted us permission to add all of the tracks to our library! We opted to omit some of the shorter tracks for aesthetic purposes, but if you'd like to own the complete collection of tracks, you can download the album via Loudr. Those of you who are more interested in a smaller sampling of some of the album's highlights can opt to download the abridged version of the album here. Please enjoy this wonderful new addition to the Radio Hyrule library! Special thanks to Jeremiah for helping us put together a wonderful event last night. 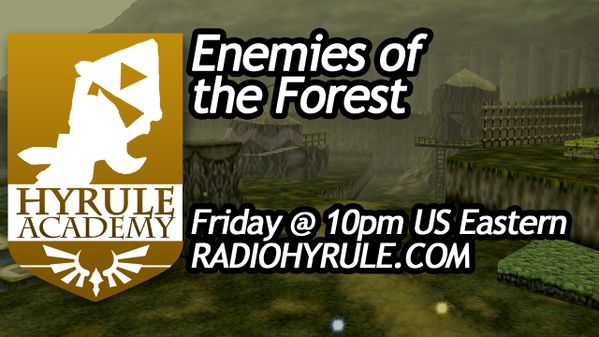 Get ready for more Hyrule Academy tonight at 10pm US Eastern! Have a great weekend. 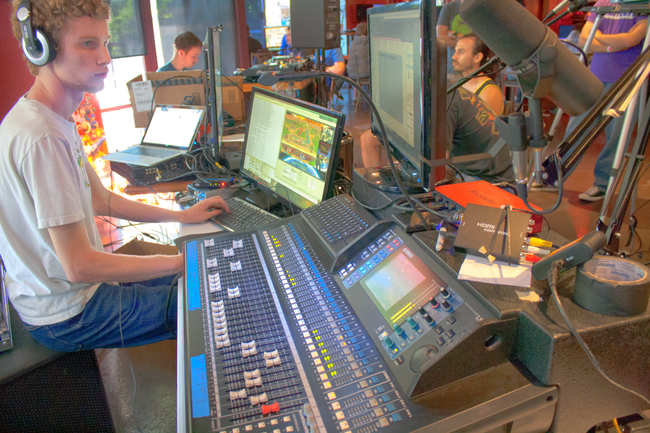 This Thursday, May 14th, we will be hosting a LIVE listening event to premiere the Link's Awakening Orchestral Arrangement album, created by Jeremiah Sun (aka The Second Narrator). We will be airing the complete album in its entirety, along with arranger commentary! Jeremiah will be telling us about his processes and inspirations as we're guided through the album and reminiscing about one of the greatest handheld titles to date. The event will be kicking off on Thursday at 6pm US Pacific, and should be wrapping up at around 10pm. As usual, we will be partying in the chatroom and continuing the discussion all throughout the event. Be sure to stop by! Hyrule Academy is back after last week's vacation! Join the discussion in our chatroom at 10pm US Eastern. April is now behind us, along with our hopes of releasing our Android application before May, but the wait is still almost over. The delays are due to complications with the submission and review process, but those have been taken care of and we are now ready to do one last beta test phase before releasing the final app. Everyone who has submitted a donation or has bought request tokens from Radio Hyrule will receive an invitation to participate in the beta test and be the first to use the app. It will be publicly available as soon as we can determine the app to be stable. Thanks for your patience! 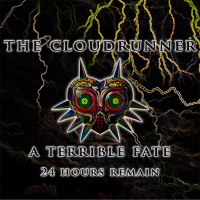 The CloudRunner has completed his "A Terrible Fate" trilogy album of Majora's Mask music with the release of the final installation, 24 Hours Remain. If you haven't checked out the first two parts of the album, 72 Hours Remain and 48 Hours Remain, you should give them a listen! While you're at it, we also have an interview with The CloudRunner about his albums you can read through. Enjoy! I know this might be a stretch, but is it possible to support the 3DS's internet browser for Radio Hyrule? To our knowledge, the 3DS's browser doesn't support audio streaming in any format, though we will continue looking into the possibility. We'd love to add more support for portable platforms. There will NOT be an episode of Hyrule Academy tonight. 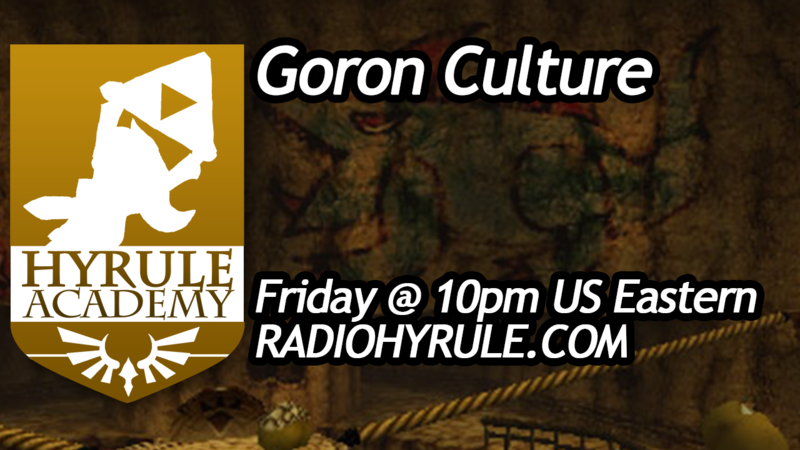 Take a break from class this week and join us again next week when we'll be discussing Goron culture!